The oldest known photograph of the Woodlawn Depot taken July 14th, 1947. The building now housed a Paint, Roofing & Supply Co. The Woodlawn Depot, built in 1904, was originally located at 6501 1st Avenue South, in Woodlawn, a community in the city of Birmingham, Alabama. The 1916 Birmingham city directory listed the location's name as the East Lake Freight Station. Later, in the 1925 directory, it was simply called the L&N Freight Depot. 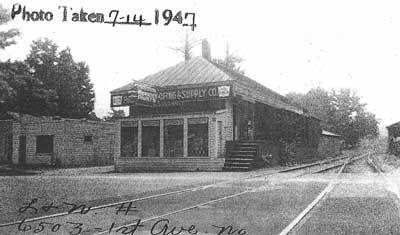 Records show that by 1947, the station had been converted to a Paint, Roofing and Supply co. The photo shown of the building is the only known image from that time period. It is now home to the Boone Library after having been moved from the Woodlawn community.